The slow, pensive pace of the friars and the ancient and captivating liturgical chants move and resound in its shaded corridors. 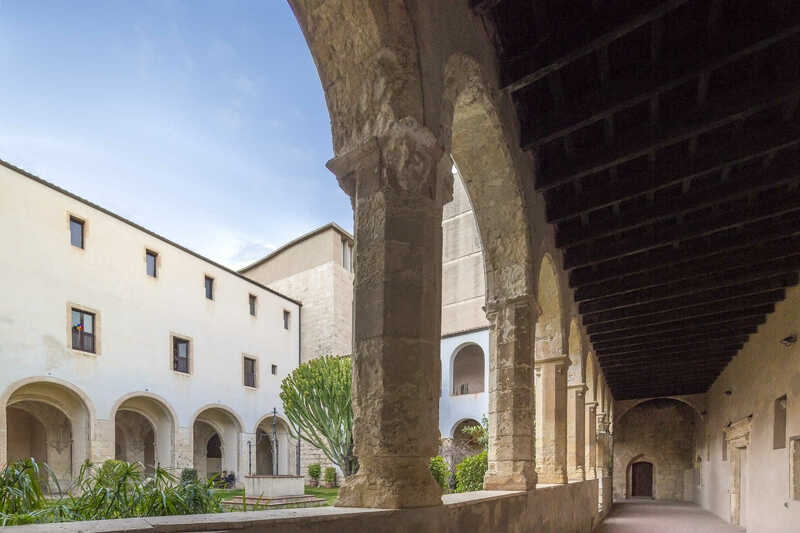 The cloister of San Domenico is a perfect model of medieval architecture in Cagliari: right in the centre, in the district of Villanova, at the foot of Castello. It embodies the spirit of the district, anchored in the religious tradition that comes to life every Lent in the Processioni dei Misteri (Processions of the Mysteries). The convent was built at the expense of the monarchs of Aragon and, in 1533, Charles V granted it the name of "regio" (royal). 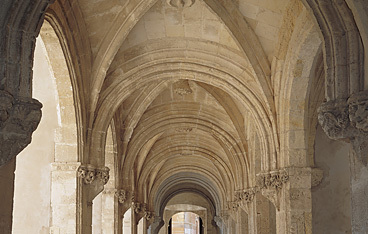 The cloister and adjacent crypt represent what has survived of the monumental complex, which was destroyed by bombing in 1943. The reconstruction during the Post-war period maintained the original structures as a crypt beneath the new building and very little of the ancient church was saved. The floor plan of the cloister is square and measures 25 metres on each side: two original wings have been maintained - one from the 15th century and the other from the 16th century. The eastern and northern wings are the result of the rebuilding ordered by Phillip II of Spain in 1598. 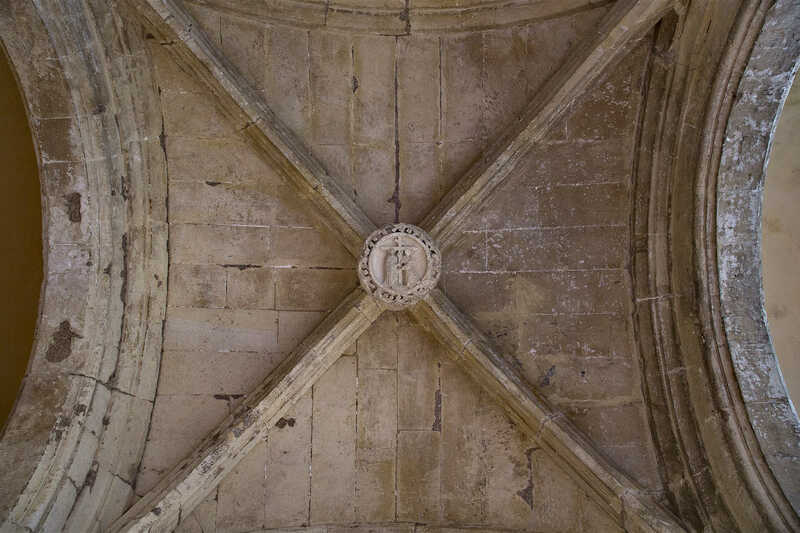 In the west wing, there are seven fourteenth century cross-vaulted chapels in Gothic Catalan style, resting on capitals sculpted with plant-inspired designs and animal figures. Once past the door and the steps, you will see two white vaults above you. The entire perimeter opens onto a garden with rounded arches, adorned with succulent plants. 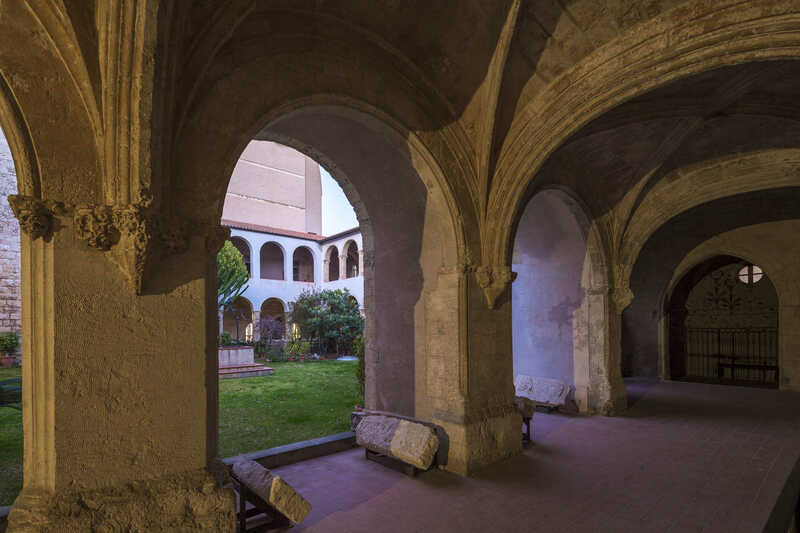 You can sit on a step and observe the meditating friars passing by, watch a function or one of the concerts that are often held in the crypt, which is sometimes also a location for photographic exhibitions and shows. Otherwise, you can simply walk along the corridors, in an atmosphere of worship and mysticism, before going back to discovering Cagliari and devoting your afternoon to some shopping in the town centre. From Via Manno, you can continue on through the historical districts: from the unique Bastion of Santa Croce to the Torri dell'Elefante and that of San Pancrazio, to the monuments of Stampace. From the Bastion of Saint Remy to the elegant shopping streets and the other buildings of worship in Villanova, like the churches of Sant'Anna and Sant'Antonio, to the distinctive streets full of typical restaurants and shops of the Marina, overlooking the harbour with the splendid palaces of Via Roma, among which the Palazzo Civico (Municipal building). Otherwise, you can move in the direction of the hill of Bonaria, visiting the Basilicas of San Saturnino, the most ancient in Sardinia, and Nostra Signora di Bonaria, the Christian temple of the Island and, next to it, the monumental cemetery. Il chiostro di San Domenico si trova in via XXIV maggio a Cagliari. Da piazza Garibaldi, vai verso via XXIV Maggio in direzione sudovest. Imbocca via XXIV maggio a destra e poi, sempre a destra, via San Domenico.